Wind Turbine Market size in 2017 was over USD 50 Billion with annual installations to exceed 70 GW by 2024. The global market in the present industrial regime has extensively been influenced owing to rising energy demand from utility aided renewable establishments and privately-owned wind farm projects. Supply and demand balance have been a continuous concern for private entities and utilities which has strengthened the fund flow toward the development of renewable power generation plants. Increasing investment pertaining to the replacement of conventional power generating technologies with advanced power generating stations to curb GHG emissions will stimulate the global market share. In 2016, Government of China introduced a new action plan to limit the emission level to 18% by 2020. Furthermore, the introduction of large offshore products has led to an escalation in the overall plant performance which in turn will positively influence the overall industry dynamics. Horizontal wind turbine industry is projected to witness a growth over 7% by 2024. Cost effectiveness, and high efficiency are some of the significant parameters which will augment the industry outlook. Improved operational activity statistics in comparison to its competitive counterparts will further justify the product demand. Capability to produce energy in unstable conditions along with ease of operations and low maintenance are some of the key features restructuring the vertical axis wind turbine industry growth. These units are suitable for residential applications and low rated capacity adhered by positive outlook toward product deployments will enhance the industry growth. Onshore market is anticipated to witness gain of over 5% owing to low carbon emission and economical cost structure when compared to its alternatives. Denmark, in 2017, consumed about 43% of its power from wind where 70% of the electricity generation has been from onshore units. Declining offshore project development cost, higher efficiency and comparative decrease in visual pollution are few essential parameters which will positively impact the offshore market growth. In 2017, as reported by leading agencies, UK prices of offshore units have witnessed a decrease of 31% in the last four years. Low cost of installation coupled with government incentives including feed in tariff and net metering will sway the grid connected wind turbines market outlook. Swift expansion of utility based-power networks to cater rising energy demand across residential & industrial areas will further propel the industry growth. 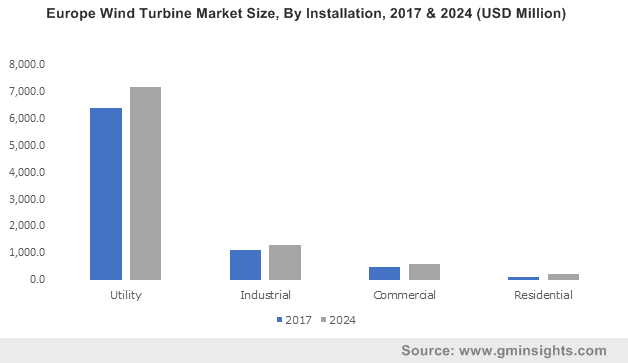 The stand-alone wind turbine market is set to grow owing to operative economic feasibility in remote areas when compared to grid connected power networks. Regulatory schemes toward rural electrification along with increasing adoption of microgrid electricity networks will further proliferate the business landscape. < 100 kW wind turbine market is set to exceed an annual installation of 1 GW by 2024. Ongoing development of co-generating units to endure heat & energy consumption across small industrial, commercial and off grid networks will strengthen the technological adoption. Furthermore, current technological advancements with respect to the improvement of effective re-generative units to sustain low energy requirements across these installations will further augment the product penetration. Adoption of distributed generation technologies across existing energy applications will drive the 1MW to 2MW wind turbine market growth. Light weight, fewer moving parts, improved efficiency, compact size, lower emissions, and lower costs are few important parameters driving the acceptance of these products. In addition, current technological enhancement with subject to the flexibility and efficiency improvements across both recuperated and un-recuperated systems will further positively impact the industry outlook. Residential applications in the current years have observed a substantial expansion subject to the rapid urbanization and growing electricity demand across the globe. The deployment of large turbines across the residential applications typically decreases the bill by 50% to 90%. 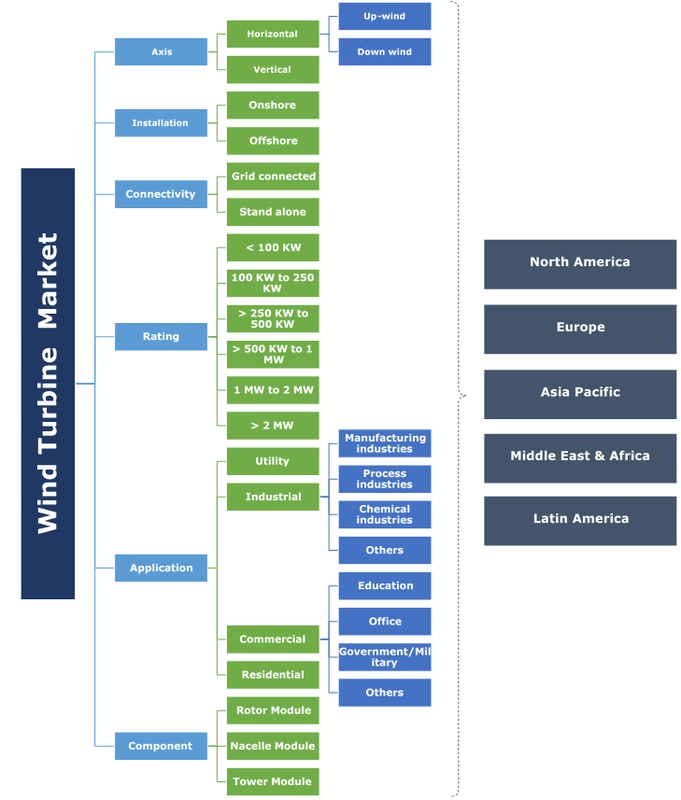 Utility wind turbine market is projected to surpass USD 60 Billion by 2024. Rising concerns on account of the establishment of renewable energy mix across various industries followed by technological advancement in distributed generation will positively influence the industry landscape. Rapid expansion of domestic manufacturing facilities along with ongoing industrialization across the emerging regions will boost the business growth. Increasing investment toward the expansion of wind-based technologies coupled with increasing adoption of large capacity units will significantly impact the overall product cost. Increasing industrial competition has rendered significant decrease in the costs of rotor modules subject to volume manufacturing & operational effectiveness. Inclination towards enhanced tower length & blade size to integrate efficient resource utilization will positively influence the overall market potential. The U.S. market size is anticipated to surpass 7 GW of annual installation by 2024. Increasing domestic system production, decreasing component costs coupled with determined targets toward addition in capacity from renewable sources will nourish the business landscape. According to the U.S. Department of Energy, in 2016, installation of these units grew by 11%, establishing over 20% of the new added generation capacity across the nation. Europe market share is anticipated to witness growth over 6% on account of energy security initiatives, decarbonization reforms and favorable directives. The Renewable Energy Directive introduced by the European Union states the policy for the production and promotion of sustainable energy sources in the region. This directive has laid the targets to achieve 20% sustainable energy integration in the overall energy scenario with wind energy accounting over 200 GW installed capacity by 2020. Prominent players in the market include Enercon, Vestas, General Electric, Nordex Acciona, Siemens Gamesa, Senvion, MHI-Vestas, Goldwind, United Power, Envision Energy, Suzlon, Mingyang, Wobben, WEG SA, Impsa, Clipper, Bergey, LM Windpower, Enessere, and Northern Power Systems.